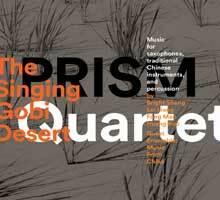 Partnering here with the ensemble Music from China, PRISM presents works by four Chinese-born American composers. The Singing Gobi Desert reveals that saxophones and Chinese instruments have a natural, if unexpected, affinity. For nearly 30 years, PRISM has stood at the vanguard of new music ensembles, commissioning works across a broad spectrum of styles, and demonstrating the saxophone's versatility.